The Hyde at Broad and Pine Streets (center) and the SLS Lux (left), in an artist’s rendering with the view looking northeast on Broad Street. The plan is for differing price points to prevent the hotels from competing with each other. Los Angeles hospitality mogul Sam Nazarian plans a second Philadelphia hotel, a slightly less pricey sibling of the high-end SLS Lux he's building with local developer Carl Dranoff. The new $75 million proposal by Nazarian's SBE Entertainment Group and Dranoff Properties calls for a 22-story tower with 76 boutique hotel rooms and 83 apartments at Broad and Pine Streets, about a block south of where the SLS will rise. The hotel, part of SBE's new Hyde chain, would be priced to compete with the mid-high-end likes of Kimpton Hotel & Restaurant Group's Monaco and Palomar hotels here, while the SLS Lux takes on the Four Seasons and its super-luxury ilk, said Arash Azarbarzin, president of SBE's hotel unit. The differing price points will keep the company from competing with itself as it attempts to satisfy more of the growing demand for Center City hotel rooms, Azarbarzin said. "When you go into a city, you want to be able to take advantage of as much of the market as you can," he said. SBE is doubling down on Philadelphia at a time when the number of visitors has reached new highs. Visit Philadelphia, the local tourism-promotion agency, reported Dec. 22 that Center City hotel occupancy in 2015 was projected to hit a record 77.4 percent. 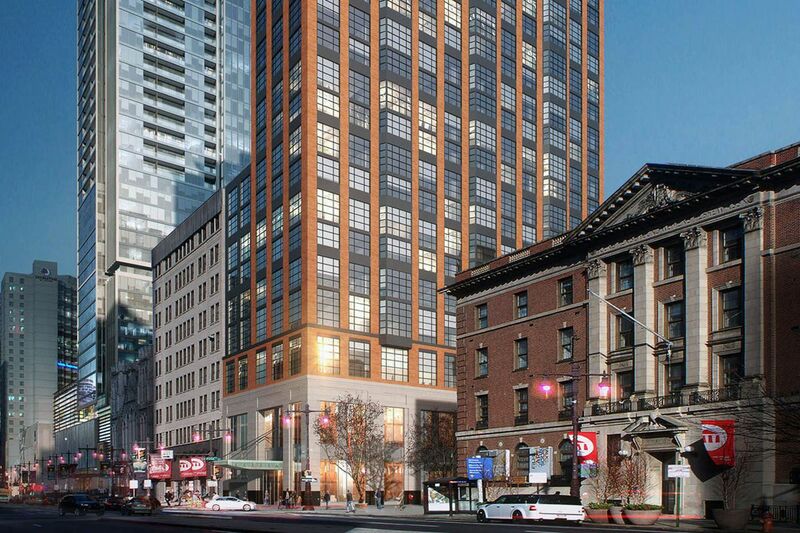 Other relatively new Philadelphia entrants include San Francisco-based Kimpton, which opened the Monaco near Independence Hall three years after unveiling the Palomar close to Rittenhouse Square in 2009. Those hotels avoid direct competition by serving different parts of the city, said Peter Tyson, a senior vice president at PKF Consulting/CBRE Hotels. A third Kimpton was proposed by Miami's Peebles Corp. in that company's winning 2014 bid to redevelop the Family Court building at 1801 Vine St.
Peebles and Kimpton, which has since been acquired by InterContinental Hotels Group, did not return phone messages seeking an update on those plans. Peebles' October application for tax credits to restore the historic court building makes no apparent mention of Kimpton and notes that the filings will be updated "once a hotel operator is secured." Denver-based Sage Hospitality may also expand in Philadelphia after opening its first hotel here, the Logan, last month, said Peter Karpinski, operations chief of Sage's restaurant affiliate. "We want to open up in certain marketplaces," he said. "Then we want to cluster in those marketplaces." Such clustering is common for hotel companies, Tyson said, since it allows human resources, accounting, and other administrative staff to manage multiple properties easily, while giving operators more clout when contracting with outside vendors. It also gives sales teams more flexibility in booking rooms for big events such as meetings and conferences, he said. But they don't want to have too many of their own properties in a tight geographic area, Tyson said, since "then they just cannibalize each other." Azarbarzin said SBE was aware of those dangers when it designed the Hyde to "live next door" to SLS properties by assigning it a different level of luxury. Staying at Philadelphia's SLS, which is scheduled to open in 2017, will cost $300 to $375 a night, about $50 or $60 more than the Hyde's rates, he said. The first three Hyde hotels are under construction in and near Miami Beach, home to one of the three SLS properties now in operation. Dranoff said he hopes to begin work in about a year on the Philadelphia Hyde, which is being designed by BLT Architects and would replace a parking structure made notorious by a 1997 collapse that killed a passing judge. The developer is under contract to buy the property from the estate of real estate speculator Samuel Rappaport and is working to have the parcel rezoned to permit the tower's height and density. "Sam Nazarian had told me that they felt Philadelphia could support a second brand, and they told me to keep my eyes open," Dranoff said. "I did, and I found this site."